A dark brown (or black) front door with bottom panels painted white, as to make it look like a face. Like so many of my walks, I come across all sorts of curious things. Of course, at this point in the year, I see a lot of and take a lot of pictures of flowers. I can't help it. They're pretty and amazing with their colors mixtures. But clearly this is not a flower. It's a curious doorway that looks like a face. Sure it's just paint, but I'm guilty of that human tendency to see faces in things. It's a fun tendency in that it allows to ask question or think differently. For instance, what if doors has some human capacity to them. I meant we're definitely entering the "smart technology" age, so I can imagine a front door being a Siri-type device that greets anyone that comes by, "Hello Ms. Mailperson!" "Greetings Mr. Gas-Reader Person!" "How do you do, neighbor's dog?" 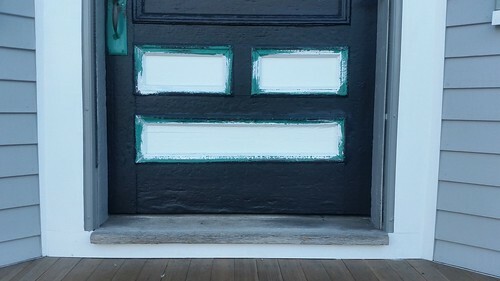 Given that none of the other panels were painted on this door, it does make me wonder if it was intentional to make this door look like a face or they just ran out of paint.